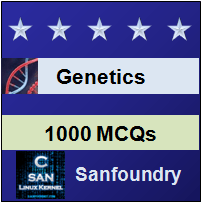 This set of Genetic Engineering Multiple Choice Questions & Answers (MCQs) focuses on “Modifications in PCR-01”. 1. What are the possibilities which can occur until the temperature has reached for primer annealing? Explanation: Until the temperature has reached for primer annealing there are chances of extension by polymerase. It is so because at low temperatures primer can anneal in a non specific manner and thus non specific products are generated. 2. Hot-start PCR is a modification of PCR. Which of the following is not corresponding to it? Explanation: Hot-start PCR is a modification which is used in order to overcome the problem of extension before the maximum temperature of first cycle is reached. Hence, polymerase is added only after the maximum temperature for first cycle is reached. Hence, there are more specific products which are generated because proper annealing of primers has taken place. It is suitable for small number of samples but not for large number of samples. Explanation: An alternative to start the extension at higher temperature is to make the polymerase inactive by binding an antibody to it. The antibody detaches itself at higher temperature and thus polymerase is activated at higher temperature. Also, the polymerase or Magnesium can be introduced into wax beads and these beads melt at higher temperatures. Magnesium is required for the polymerase to function. 4. The primer annealing temperature is often very low from the maximum temperature. This low temperature leads to some mismatches. Is the statement true or false? Explanation: The primer annealing temperature is often very low from the maximum temperature. Though the low temperature is for stable binding of the template and the primer but at times it leads to mismatches. Explanation: It is done in order to overcome the slight mismatch which takes place at lower temperatures. For this, initially the temperature is kept very high and it is reduced in further cycles. As the temperature is reduced, a stage is reduced at which correct primer-template binding is possible but not the incorrect one. In this, in the earlier cycles more stringent conditions are there and in later cycles less stringent conditions are there. Explanation: Nested PCR is that in which two PCRs are carried out. In the first PCR, it uses a conventional template and the second PCR is carried out using the product of first PCR as a template. 7. If two successive PCRs are carried out, in which PCR there are chances of having a non-specific product? Explanation: If two successive PCRs are carried out, there are non-specific products created in the first PCR. But there are least chances that non-specific products also have annealing sites for both the primers in the second PCR. Hence, non specific products are not generated in second PCR. Explanation: The process of inserting an amplified PCR product in a vector for cloning is termed as making a hard copy. It is further maintained by conventional means. 9. How can PCR product be cloned into a vector? Explanation: PCR product can be cloned into a vector if the DNA molecules are blunt ended or it can also be done by restriction enzyme digestion. In restriction enzyme digestion restriction sites are introduced. 10. Which of the following statement is incorrect regarding cloning of PCR products? Explanation: If cloning is done via restriction enzymes, restriction sites are induced before amplification. The restriction sites are induced in the primers before annealing. As the primer binds, the restriction sites are induced at one end of intermediate molecule. In full length molecules, restriction sites are at both the ends. And the amplified molecules can be cut at both the ends by appropriate enzymes. 11. Topoisomerse I is also used for cloning of PCR product at times. Which of the statement holds true for such type of cloning? Explanation: In the case of this type of cloning, the restriction site is induced into the PCR primers and the enzyme is induced into the vector. The enzyme cuts the PCR product at the restriction site and joins it to the vector. Topoisomerase I is responsible for cutting only one strand and Topoisomerase II cuts both the strands. Explanation: Generally, the amplification is carried out of the region which is flanked by the primers. But in inverse primers amplification is carried out of the region which lies outside the primers.